We have a new baby in the family and needless to say getting a few hours to spare to write a new hypnotic blog post has proved difficult. So when I sat down to write it I had to come up with a topic I had not yet covered. And then it popped into my head -'Nail Biting' This is a fairly common complaint and without fail every year I have a couple of clients that come to see me to solve this problem. According to the statistics and studies done on nail biting, 28-33% of children ages 7-10 years old, 44% of adolescents, 19-29% of young adults and 5% of older adults are nail biters. 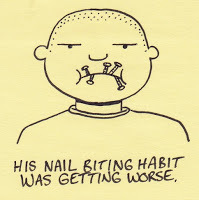 Nail-biting, like every other habit is formed over time as we go through life and we condition ourselves into our behaviors and habits. From the time we are born we are learning whether it be walking, talking, reading or writing, so that it becomes automatic and subconscious, i.e. without us even having to think about it. Unfortunately fears and habits like Nail-biting can also emerge. Fortunately, Hypnosis is a great way to stop any bad habits.and research results have indicated that suggestions preceded by hypnotic induction resulted in symptom improvement when it comes to Nail-biting1. The success of the treatment does very much depend on the client committing to the process (and believing it will work), following my instructions and completing the program. However the same can be said for any of the programs that I offer. I find with something like Nail-biting, that it can take a few sessions for the client to learn some techniques such as self hypnosis and anchoring a positive state to help eliminate the habit. With time the old neural pathways and triggers associated with the habit can be broken. A few words here again about the hypnotic state (something I frequently get asked!) - Remember that it is a natural state of mind that we all have experienced at one time or another, e.g. daydreaming. 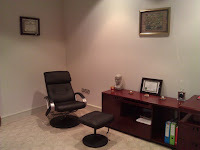 It is just a nice feeling of mental and physical relaxation; It is not sleep and you will not be 'unconscious' or 'asleep', in fact it is a state of heightened focus and creativity, where your mind is open and receptive to absorb new suggestions, ideas and concepts.My clients are always in control and can open their eyes any time they wish. Thankfully so far all of my clients have enjoyed the process so much that they didn't want to open their eyes, but go deeper into the process. In other words the process is completely safe - all hypnosis is 'self-hypnosis' and is very enjoyable. I have dozens of happy clients that can verify this! While the client is guided into the hypnotic state, guided imagery and visualization can be utilized to help. For example I would suggest the client see themselves in the future with their nails looking great, trimmed and neat, so that they can easily peel an orange…and then suggest ‘and how good does that feel’? Positive suggestions can be presented to the person and a new subconscious learning introduced. These are just a few of the many methods that I use to encourage the client to open up a pathway to really make the trance-formation and drop their habit. Like all my hypnosis programs, I just facilitate a process that I guide people though, sort of like a guide or instructor, leading and empowering them to achieve their goals. My Nail-biting program is 3 sessions and cost 195 euros. Call now and kick that habit out of your life, you don't want it, you don't need it, you don't have to have it! 1. 'Hypnosis and the treatment of nail biting: A preliminary trial.' Wagstaff, Graham F.; Royce, Catherine, Contemporary Hypnosis, Vol 11(1), 1994, 9-13.